Highly flexible and very resistant protective sheath with FLEXASteel. 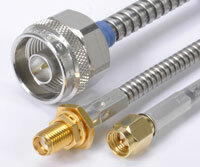 Internal diameter of the hose available from 3 mm to 14 mm. Reinforcement and protection of your coaxial cable through additional protective sheath made of steel. The used coaxial cables in use on machines and in the automotive sector are thus more durable. Our spiral-coiled hoses up to + 400 ° C are available upon request.